My baking partner-in-crime Amy and I LOVE reading blogs. One blog that we both read is Bakerella's blog, which features sweet inspirations and baking ideas. She is also the famous inventor of Cake Pops. Whenever Bakerella updates her website with a new recipe or creation, we ooh and ahh over it in admiration and discuss how we can someday try to recreate what she made. We also like to look at her recommendations when it comes to baking tools. A few months ago, Bakerella shared with us readers her fabulous all-in-one carrier. 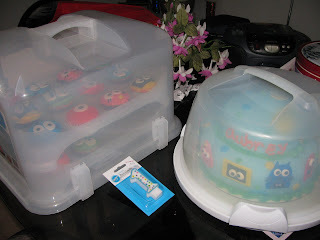 The carrier looked so cool and perfect for so many things, such as cupcakes, brownies, cake pops, sheet cakes, and more! 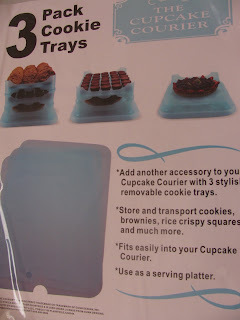 It is has removable tiers and the cupcake trays are stackable and the cups are deep enough to keep the cupcakes in place, but not too deep so removing cupcakes will be difficult. Guess what my wonderful friend, Joanna gave me for Christmas??? The Cupcake Courier cupcakes/desserts carrier! The funny thing is that I received this awesome gift, but I did not get a chance to look at it closely due to all the holiday craziness. 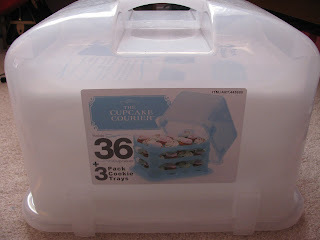 It wasn't until I was prepping for a birthday party and Amy and I were talking about awesome cupcake carriers when I decided to take a closer look at my Christmas gift! Lo and behold it is the same exact carrier! Thank you Joanna for such an awesome Christmas gift that I didn't fully appreciate until recently (Previous blog to show how I unappreciated this gift!)!! !